In Part I of this blog series, I described my research process for identifying the level to which the World Bank (WB) is conducting participatory post project sustainability evaluations for its many international development projects. 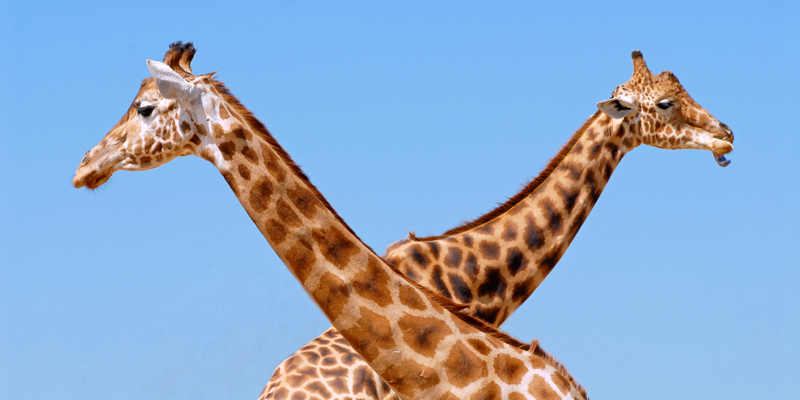 Through extensive research and analysis of the WB’s IEG database, Valuing Voices concluded that there is a very loosely defined taxonomy for ex-post project evaluation at the WB, making it difficult to identify a consistent standard of evaluation methodology for sustainability impact assessments. The key takeaway from this definition is that these reports supplement desk studies (ICRs) with new fieldwork data provided, in part, by the participants themselves. The IEG database lists hundreds of PPAR documents, but I focused on only the 33 documents that came up when I queried “post-project”. They are all recent documents – the oldest document was published in 2004, and the most recent documents from 2014. → Who was involved, specifically? Was there direct beneficiary participation? What were the research methods/procedures used? 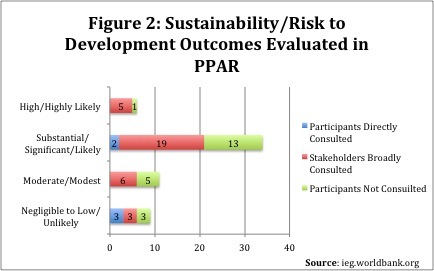 • What was the level of sustainability (termed Risk to Development Outcome* after 2006) established by the PPAR? → Was this different from the level of sustainability as projected by the preceding ICR report? → If yes, were they semi-structured (open-ended questions allowing for greater variety/detail of qualitative data) or quantitative surveys? • How many beneficiaries were interviewed/surveyed? → What % of total impacted beneficiary population was this number? 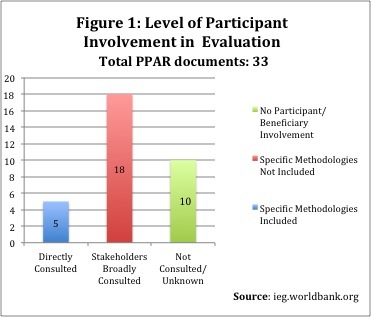 Only 15% of the PPARs (5) gave details about the interview methodologies, but of this only 9% of the PPARs (3) described in detail how many participants were consulted, what they said and how they were interviewed (India 2004) (Kenya 2005) (Nigeria 2014). These percentages are illustrated in Figure 1, below, which gives a visual breakdown of the number of reports that involved direct participant consultation with detailed methodologies provided (5), the number of reports where stakeholders were broadly consulted but no specific methodologies were provided (18), and the number of reports where no participants were directly involved in the evaluation process (10). In 54% of cases, there was some change in the level of sustainability from the original level predicted in the ICR (which precedes and informs the PPAR) to the level established in the PPAR. Ironically, of the 33 cases, 22 of them were classified as Likely or Highly Likely or Significantly Likely to be sustainable, yet participants were not asked for their input. So on what basis was sustainability judged? Of the three cases where there was high participant consultation, the Nigerian project’s (where they asked 10% of participants for feedback) sustainability prospects was only moderate while India (also 10% feedback) and Kenya (14-20%) both were classified as likely to be sustainable. Along the Y axis of Figure 2, below, is the spectrum of sustainability rankings observed in the PPARs, which range from “Negligible to Low” up to “High”. For each of the projects analyzed (there are 60 total projects accounted for in this graph, as some of the PPARs covered up to 4 individual projects in one report), the graph illustrates how many projects consulted participants, and how many failed to do so, for each evaluation outcome. As we can see, the majority of cases that were determined to be highly or significantly sustainable either did not consult participants directly or only consulted stakeholders broadly, with limited community input represented in the evaluation. These are interesting findings, because although there is a lot of supposed sustainability being reported, very few cases actually involved the community participants in a meaningful way (to our knowledge, based on the lack of community consultation discussed in the reports). However, unless these evaluations are taking place at grassroots level, engaging the participants in a conversation about the true self-sustainability outcomes of projects, you can’t really know how sustainable the project is by only talking with donors, consultants, governments, etc. Are the right voices really being represented in this evaluation process? *Note: the “Sustainability” ranking was retitled “Risk to Development Outcomes” in 2006. While projects were deemed sustainable, this is based on very little 'beneficiary' input. The significance of this information is simple: not enough is being done to ensure beneficiary participation in ALL STAGES of the development process, especially in the post-project time frame, even by prominent development institutions like the WB/IEG. While we commend the Bank for currently emphasizing citizen engagement via beneficiary feedback, this still seems to be more of a guiding theory than a habitualized practice. Although all 34 documents I analyzed claimed there was “key stakeholder” or beneficiary participation, the reality is that no consistent procedural standard for eliciting such engagement could be identified. Furthermore, the lack of specific details elaborating upon interview/survey methods, the number of participants involved, the discovery of any unintended outcomes, etc. creates a critical information void. As a free and public resource, the IEG database should not only be considered an important internal tool for the WB to catalog its numerous projects throughout time, but it is also an essential external tool for members of greater civil society who wish to benefit from the Bank’s extensive collection of resources – to learn from WB experiences and inform industry-wide best practices. If one thing is certain, it is that global emphasis on sustainable development will not be going away anytime soon…but are we doing enough to ensure it? Great insights on the benefits, realities and constraints to direct beneficiary participation in project evaluation and how to overcome these.